Welcome to post #500! I'm so glad you could make it! And I'm so glad to have all of you readers, visitors and friends - because without you, there would not be 500 posts! Blogging and making it to my 500th post is working for me! So to celebrate, I think I'll tell you 500 random things about myself...or not. Maybe I could give you 500 chocolate recipes! Hmmm, maybe not. 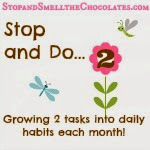 There is something I could do though - I could talk about CHOCOLATE!! I have a very special chocolate review to share with you today (because not just any chocolate would be worthy of my 500th post!) AND I have a giveaway of some of that chocolate, so you will want to read carefully! I want to tell you all about Chocri chocolate today! Chocri has a successful chocolate business in Germany making customized chocolate bars and they are launching in the U.S. in January! I was delighted to be able to preview their chocolate bars! The Chocri concept is simple - YOU know what you like best in your chocolate, so YOU get to create your own chocolate bar! 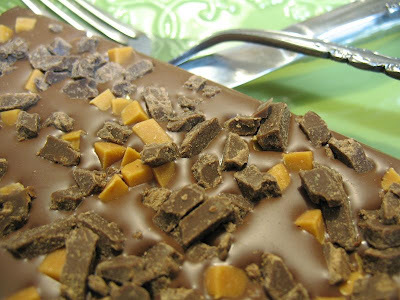 You pick your favorite chocolate base and add the toppings (more than 80 to choose from) you like. That bar is hand-made just for you, packaged up and sent out (FABULOUS unique gift idea!). Me: Oh you get to name your creation! What do you want to call it? Me: Fred?? You want to name it Fred?? Me: But the name gets printed on the outside of the box! So what do you want to call it? Me: Sigh. If you name it Fred, I'm going to blog about it. Again - creamy, delicious milk chocolate. Loved the caramel and pretzel with the chocolate! I really should have added some sea salt to make it complete - live and learn! Chocri will officially launch in the U.S. on January 11 (perfect timing for Valentine's Day gifts! ), but I can tell you a little secret! They will have an invitation-only launch on January 5. To get the invitation code, you only have to give your email address at www.createmychocolate.com (there's a box on the left). They will only send the password - no spam - so people can enter the website before the general public. Sounds wonderful, doesn't it? But it gets better. The chocolate in these customized bars is organic and fair-trade chocolate from Belgium. And Chocri donates part of their revenues to a charity organization that supports children at the Ivory Coast where cacao is produced (plus people can donate at the checkout as well). You can find more info at the Chocri blog! Please wipe the drool off your screen so you can read about the giveaway!! 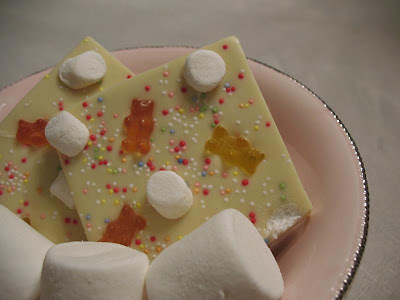 I get to give two of my wonderful U.S. readers a free Chocri customized bar!! Thanks to Carmen (an absolute delight to work with), the winners will each be able to design their own bar with the chocolate and toppings they choose! WOW!! Thank you Chocri! Leave a comment on this post telling me what kind of bar you would create! This giveaway will be open through Sunday 12/6 and winners announced on Monday 12/7. Winners will be chosen by random.org from comments on this post. Disclosure: Chocri sent me four free customized chocolate bars to review and is giving two free bars as a giveaway. I have received no other compensation for this post. My opinions, as always, are completely my own! Chocri bars are working for me and will make a wonderful gift, though not in time for Christmas! Stop by We Are THAT Family to see more Works-For-Me-Wednesday gift ideas and tips! Yum! I would definitely go dark chocolate with caramel, mini marshmallows (who can resist) and pretzels. A great combination of sweet, salty and crunchy. Follow on Twitter and subscribed to the newsletter. OH, MY, WORD!!! Yummy! This would be like, my dream job!! I would use dark chocolate, add some pretzels and some caramel, maybe top it off with something pretty--not sprinkles, but some crushed something. Yum! Happy 500th blog post! I'm excited for you. Gosh, I would have to try Dark Chocolate with Macadamia Nuts and Cappuccino Chocolate Drops!! WOW! I am so loving this my friend. My bar would have to have dark chocolate, caramel, nougat, sea salt and I could keep going! Oh yummo! Big I really need to learn how to rig that random counter for this one size hugs to you! The breakfast bar looks and sounds divine. Please, please, please, please enter me! I'm drooling! And enter me one more time because I'm signing up! Your Sweet and Salty and Coffee Break combinations look good to me! I'd probably start with milk chocolate, then add caramel drops, cappuccino drops, and cinnamon. If my son had his way, though, I think he'd combine dark chocolate and something peppermint! And one more entry because I'm a follower! Thanks for the great opportunity. PS -- I meant coffee break and not breakfast bar (same thing, right?). I'm so glad I found your site, and on my birthday! I would go with dark chocolate, something rasberry and maybe caramel! Wow! It's so hard to choose. I would probably try dark chocolate with strawberries. Yes I would love to win free chocolate. Thanks for hosting this. And congratulations on your 500th post. 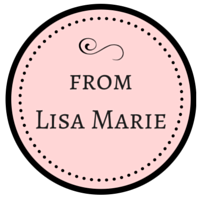 You are an awesome blogging friend! And yes, I am a longtime follower. Love ya girl! I would love to try dark chocolate with raspberries and toasted almonds. Way to go on 500! Wow! I'd make the sweet and salt one. I love pretzels with chocolate. This is a brilliant idea! Officially following your blog via Google Reader! Oh my, their topping list is AMAZING! I would go with the Dark Chocolate and Candied Rose Petals. I love your combos and 'Fred'! LOL! Hmm...dark chocolate with some toffee and some kind of nuts...pecan maybe. Oh and I signed up for their newsletter. Is that going to get me the password? I'm one of those Chocri overload types! I would make a dark chocolate bar with coconut, coffee and hazelnut brittle. Mmmm delicious. I'm following Chocri on twitter now - exciting! I think I've planned a half dozen candy bars by now. OMGoodness!!! I think my chocolate bar would have to be chocolate with carmel, marshmallow, chocolate chips, and chocolate sprinkles with some pretzels and sea salt added. Yummm-o! I check your blog every day and love your recipes. I also sent in to receive the code for the invitation only--I want to make one for my husband and kids for valentines day!!!!. Is there no end to your great chocolate posts? Super job! I would probably do milk chocolate, caramel, sea salt...something along those lines! I've been eagerly awaiting the arrival of Chocri on these shores for a while now! I'm not sure I can cope with waiting another six weeks! Congrats on 500 posts, girl! That is a big deal!! Yeah for you! Hey everyone, this is Carmen from chocri! Congrats Lisa to your big 500 first of all, but thanks everyone too for the great comments! @Jen T - yes, leaving us your email on www.createmychocolate.com will get you the password. We will send it to you on January 5! Very yummy sounding bars in this comment list, I have to grab some chocolate only from reading this! Please don't hesitate to contact me with any questions/ suggestions/ ideas you have! We are very happy to hear from you! Could I make one with EVERYTHING in it?? LOL! How about white choc. and cranberry pieces. I'm so glad I had time to read my e-mail today. Those bars look delicious. My creation would be that of a white chocolate dipped in dark chocolate with almonds in it. Then dusted with dark chocolate cocoa! I would call it my tux bar! 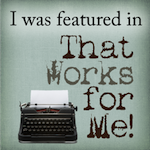 I just promoted your beautiful blog. 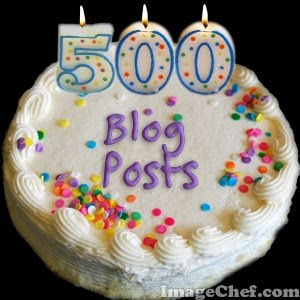 PS Congratulations on your 500th blog. That is a lot of blogging! After drooling over the list of chocolate combinations, I think I'd still go with something simple - like milk chocolate with hazelnut toffee. A close second choice would be dark chocolate with cranberries and pecans. Yummy! I already follow your blog, but I signed up for the Chocri newsletter. Have a wonderful day. A very difficult choice! I'm sure my combo would start with dark chocolate, then probably caramel drops and pretzels. Perhaps a touch of something spicy like the pepper? Their list of toppings is truly impressive! Is there an Everything Bar? ;-) I would love to get dark chocolate with macadamia nuts and strawberries. I now follow Chocri on Twitter as @Smittens05. I signed up for the launch code. I must confess I am one of those people who stands in line at the icecream shop agonizing over too many choices. I frequently have to let others behind me pass once I get to the front of the line because I still can't make up my mind. So I honestly cannot yet tell you what I would order, but I can tell you it would in some way involve peanutbutter because chocolate is just made to be married with peanut butter. Or maybe I would go a more minty direction. Wait, then there's the whole toffee/carmel direction! I'm all in for a list of 500 chocolate recipes! Haha. This giveaway is my dream come true! YummY! Thanks so much for sharing this great company. I know I'll be addicted as soon as I can get my hands on this chocolate. I forgot to comment for my second entry: I subscribe to your blog feed. Wow! What a fabulous treat. I'd choose a dark chocolate with lots of different nuts and maybe some dried fruit. YUM! 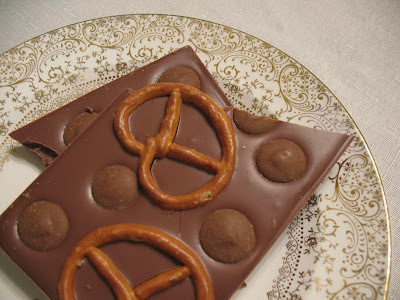 Dark chocolate with caramel drops and those pretzels. TOTALLY up my alley. And now I am totally salivating over here like crazy! SO YUMMY! Now following Chocri on twitter too. CONGRATULATIONS ON 500...wishing you many, many more posts. My dream recipe would consist of dark chocolate, pretzels, peanut butter, and nuts! 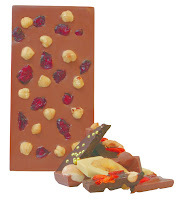 My favorite chocolate bar is milk chocolate with raisins, currants, and a mixture of nuts....mmmm. white Chocolate and something salty! Or a mix of White and Milk Chocolate. Nuts for Chunch or even peanut briddle mixed in! Oh man I am getting hungry. I'll take "Coffee Break" just the way it is. My husband could hear me drool from across the room! CONGRATS on 500 posts...way to go girl! 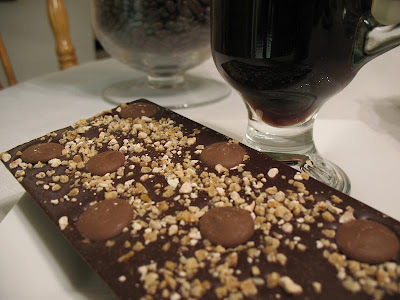 Just discovered you so I missed the giveaway, but wow, the sweet and salty bars and coffee break sound delish!